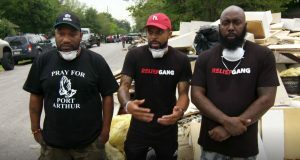 Citizen Doug is proud to have recorded the location sound for the #ReliefGang‘s efforts in Houston in this package “Hip Hop Awards Highlight: See Exactly What Bun B Did To Help Families Affected By Hurricane Harvey” for the BET Hip Hop Awards. 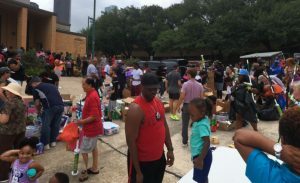 Bun B, Trae the Truth, and DJ Mr. Rogers are using their own funds and resources to provide direct relief in Houston and the other areas effected by Harvey. This was a three camera run and gun shoot at Allen Parkway Village (pictured) and locations around Houston including the #ReliefGang warehouse. Cameras by Sirius Video were Sony FS-7’s. The audio package was Sound Devices 633 based with Ambient Recording ACN networked ACL 204 Lockits and NanoLockits. Wireless was Lectrosonics SRC, SRB, and IFB with SMQV and 400a transmitters. This entry was posted in Location Sound and tagged #ReliefGang, 400a, ACL 204, Allen Parkway Village, Ambient Recording ACN, BET Hip Hop Awards, Bun B, Citizen Doug, DJ Mr. Rogers, Harvey, houston, ifb, Lectrosonics, NanoLockits, run and gun, Sirius Video, SMQV, Sony FS-7, Sound Devices 633, SRB, SRC, three camera, Trae the Truth. Bookmark the permalink.